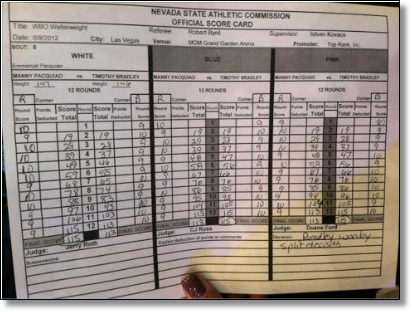 I don't know how the judges came up with the score. Considering Bradley did not land any solid punch on Manny Pacquiao. 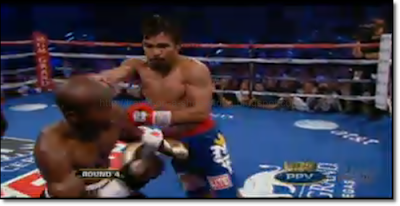 Manny Pacquiao (54-3-2 38 KOs) is favored over Timothy Bradley (28-0 12 KOs) before the fight. 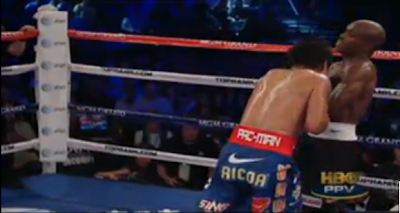 The underdog Bradley did not land any solid punch on Manny Pacquiao. When the commentators said that Timothy Bradley won by split decision and only God know's how, they suddenly stopped talking for a minute or two. They too, were overwhelm how in the world did the judges came up with their decisions. As everybody knows, Timothy Bradley was the underdog at the start of the fight. The odds heavily favor the Pacman at -450 and plus +350 for Timothy Bradley. This means a $450 bet on Pacquiao will earn $100, while a $100 bet on Bradley will earn $350. But then again maybe it was so boring already, when a boxer is undefeated for seven straight years. And no known boxer can match him in upcoming fights so they need to manipulate the results to level off the playing field. Do I smell a rematch? Manny lands 34% (253/751), Bradley lands 19% (159/839). On a happy Note! Don't despair dear readers Manny Pacquiao still wins in terms of PPV, endorsements, prize money, etc. He is the happiest loser in the block. And we are talking about money in million of dollars! Hurray! Panalo pa rin ang pinoy boxer natin!